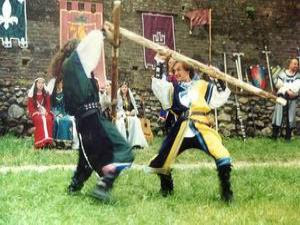 Each year Sighisoara holds a medieval festival in perfect harmony with the town's profile. I have been attending it for 2 years now and can say it's one of the most beautiful moments for me in the summer. In the citadel you can always see people dressed in medieval costumes, wearing clothes with the dust of time upon them, acting as if they have just left their house, 500 years ago. During the 3 days festival you may attend the plays with medieval profile in the most important squares and also can be a part of Sighisoara at night when movies -Dracula related mostly- are projected in the citadel. You can stroll in the citadel and at sudden you may hear some jester's screams or the citadel's representant communicating any important news for the different branches of workers in which the population was divided at those times. (ironsmiths, tins, tanners, tailors or goldsmiths). Actually in the citadel there are towers for each branch of workers. At first the clock tower was the symbol of justice in the municipal hall of the town and once served as jail. (usually those with death sentences were carried there). It suffered also an arson but was rebuilt in the same medieval spirit. The covered wooden stairs that lead to the gothic church and the german graveyard consist of around 121 steps (if I remember it well). So you see it was rather difficult to carry the dead to be buried, but also that graveyard was for the rich people in the citadel. I have seen it and it's a real beauty. I also took a nap there, in an afternoon, beside a cold gravestone and I woke up rather fresh. It's a rather strange cemetery since it's on a hill and it's more like a park with graves...and you really have a feeling of warmth and you may also feel you belong there...Just like it happened to me when I woke up :) . 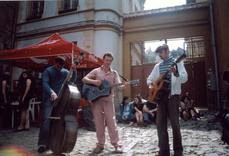 Concerts are always present during the festival, concerts with specific music that deals with the same cultural heritage. Every year an ammount of foreign tourists come here especially during the festival along with thousands (around 20000-30000) romanian teenagers, to express freely their feelings , to play the guitar in open air and to breath the air of history and its unwrapped mysteries.